Shakespeare’s Globe Theatre is an historically-important building located in London, of course, named after William Shakespeare. Both the backstory and construction of the Globe are as interesting as the playwright himself. The original Globe Theatre was built in 1576 by James Burbage, the actor-manager of a troupe known first as the ‘‘Chamberlains’’ and later as the “King’s Men.” The Globe was also the first building in London built specifically for the performance of plays. William Shakespeare joined Burbage’s troupe in the 1580’s. The acting group remained in London for roughly a decade. In 1596, however, an argument arose over lease renewal of the space, and when Burbage died in February of 1597, there was no one to renegotiate the lease the coming April. The resulting property dispute lasted another two years, during which the Chamberlains performed in a nearby theatre. But on Christmas in 1598, the company sought change. The troupe purchased a plot of land across the River Thames, dismantled their theatre, transported the pieces across the river overnight, and rebuilt it on their new space. Many of the actors, including Shakespeare himself, helped pay for the new theatre. By 1599, the Globe was up and running. The theatre quickly became a fantastic showcase for many of Shakespeare’s greatest plays. In 1613, during a performance of Henry VIII, a stage cannon (real but a prop for a play) ignited the theatre’s roof and set the theatre ablaze. It burned to the ground. The Globe was rebuilt, but historians do not think Shakespeare wrote any plays for the new theatre. 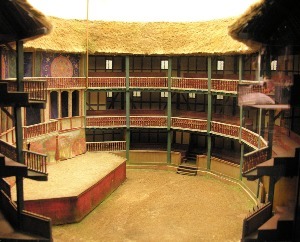 The new globe remained the showcase for existing Shakespearean plays until 1642, when England demanded the closure of all theatres under the Puritan administration. No longer used, the Globe was demolished in 1644. The task of rebuilding the Globe for the second time was initiated by an American actor many decades later in 1949. Named Sam Wanamaker, he spent 23 years fundraising and researching the appearance of the old Globe before beginning the project. No one really knows what the original Globe Theatre looked like. Panoramas and written accounts gave historians and architects some sense of the original exterior. Written descriptions and building contracts gave builders clues as to the look of the interior. In addition, several vague descriptions of the theatre in Shakespeare’s plays themselves, such as in Henry V, add to what historians know. Wanamaker finalized the plans for construction before his death in 1992. Architects and builders cut and fashioned oak planks using the same methods as 16th-century workers. The theatre’s roof and support beams were made out of the same materials as the original Globe. Its stage was the most difficult element of the reconstruction process, as almost none of the records from the 16th and 17th centuries about it survived into the 21st century. Three and a half years after its construction began, the Globe was finished. Other than elements in place for modern fire and other safety precautions, today’s Globe remains true to its original design. Shakespeare’s Globe is one of the most interesting structures in London, both because of its rich history and the beautiful plays actors put on there.